Hester Agnes Pinsent (born in Harborne, Staffordshire in 1899, registered fourth quarter). David was named after his ancestor, the philosopher David Hume. At the time of the 1901 census the family was living at 16 Lordswood Road, Harborne, Staffordshire, and the family of five had the same number of servants (a cook, nurse, under nurse, parlourmaid, and housemaid). David was then nine years old, and his father was working as a solicitor. In May 1905, when the family was living at Bennetts Hill, Birmingham, David entered Marlborough College (Boarding House C2, where the Housemaster was T. C. G. Sandford). He won the Senior Scholarship in 1907. He left the school in March 1910. On 25 June 1910 David Hume Pinsent was admitted to Trinity College, Cambridge as an Entrance Scholar to read Mathematics : he was elected a Senior Scholar in the following year, and took a First in Part I of the Mathematical Tripos (when he also won the College Mathematics Prize). The family was away from home at the time of the 1911 census: David’s mother was staying with her daughter in Eastbourne at the home of her stepsister, Miss Mary Murray Parker (63) and his brother Richard was boarding at school, but David himself and his father do not appear to be listed and may have been abroad. From 1901 to 1908 David’s mother was the only woman member of the Royal Commission on the Care and Control of the Feebleminded, and from 1901 to 1913 she was chairman of the Birmingham Special Schools Sub-Committee. 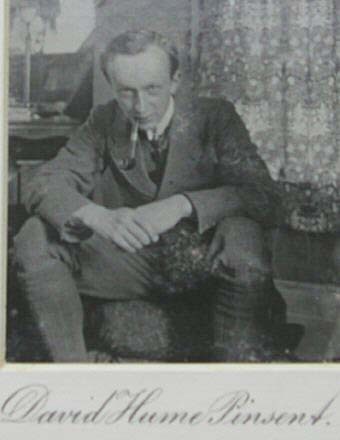 In May 1912 David Pinsent first met Ludwig Wittgenstein (who was also at Trinity College, and two years older) when he enlisted as a subject for his rhythm in speech and music experiments in the Cambridge psychology library. They became close friends, and the following September they travelled to Iceland together, with all expenses paid by Wittgenstein’s father. David Pinsent took a First with special distinction in Part II in 1913, the year he graduated. Around the beginning of 1915 the Pinsent family had moved to Glenfield on Foxcombe Hill. David Hume Pinsent was deemed unfit for military service in the First World War, and although he served by testing aircraft at the Royal Aircraft Establishment at Farnborough, he does not officially count as “war dead” in the eyes of the Commonwealth War Graves Commission. 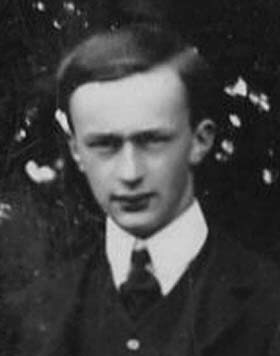 David was the co-pilot of a plane flown by Lieutenant Lutyens which broke into five parts in mid-air on 8 May 1918, and he died instantly at the age of 26 over Frimley in Surrey. Despite a search by 1,200 soldiers (including the dragging of the Basingstoke Canal and ponds in the vicinity), no trace of his body was found in the initial search, but it was found six days later floating in the canal between Frimley and Mytchett Bridges. THE MAN, WHO, IF ANY, SHALL APPREHEND THE THING THAT IS? Wittgenstein was distraught to the point of being suicidal when he heard of Pinsent’s death, and three years later in 1922 dedicated his Tractatus Logico-Philosophicus to him. MAY 8TH 1918 – AGED 26. David Hume Pinsent’s father endowed an annual Mathematics Prize at Marlborough College in his memory (as well as a Chemistry Prize in memory of David’s brother). 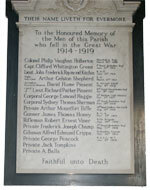 Administration was granted to Pinsent’s father on 8 May 1916 and his effects amounted to £565 12s. 1d., with a further £94 14s 1d. released to his widow on 4 June 1918. The address of David’s parents is given as 8 Chelsea Court in London just after the First World War, but they appear to have kept a house on Foxcombe Hill too for a while. Hume Chancellor Pinsent died at Glenfield on Foxcombe Hill at the age of 62 on 20 January 1920 and is buried in Wootton churchyard. Ellen Frances Pinsent (Dame Ellen Pinsent from 1937) was a mental health worker, and the Dame Ellen Pinsent Special Primary School in Birmingham is named after her. She also wrote four novels. She is not listed under Sunningwell in Kelly’s Directory from 1922, but she came back by 1930 to live at Rough Lea on Boars Hill, and she was still there when she died at the age of 83 on 10 October 1949. She was buried in Wootton churchyard with her husband. Hester Agnes Pinsent married Edgar Douglas Adrian on 14 June 1923. He later won a Nobel Prize and was President of the Royal Society, while Hester was a mental health worker and was created a DBE in 1965. She died on 20 May 1966. They had three children: Anne Pinsent Adrian, who married the physiologist Richard Darwin Keynes,	and then twins: Richard Hume Adrian, 2nd Baron Adrian (1927–1995), and Jennet Adrian (born 1927), who married Peter Watson Campbell.